Milwaukee’s Second Snowiest Winter Ever! *The Weather Service points out that totals for Milwaukee will only continue to rise as the winter season still has the rest of March and into April remaining. [Also, no point in even counting in Madison, anymore – they’ve already broken the record for MOST snow ever over there]. Moving to a new house, trying to get the old (duplex) house ready for new tenants, looking for new tenants, helping one (family relation) set of tenants to get a new apartment and leave our place because they’ve gotten behind in rent (and owe us money, which is stressful and upsetting), starting Emma at a new daycare, taking care of Emma every day, both of us working full-time, Paul doing his last semester of law school and hunting for a job, AND trying to get ready for a new baby on the way…. Last weekend, Paul finished painting the baby’s room (of course, it happened to be the ONE room of the new house that needed painting – it had previously been a crazy midnight blue color with an irremovable Bob Marley sticker on the wall – not baby friendly). Also, during this week, Paul managed to find where, in those mystery moving boxes in the basement, our newborn baby clothes and nursing gear have been hiding! (Now, I’m just a few laundry loads – and a shopping trip for tiny diapers – away from stocking the baby’s dresser with her first clothes and supplies). And finally, today, after an increasingly frenzied search, he has located the baggie of hardware required to reassemble our crib so that our little one will have a bed of her own when she’s ready for it!! (Not knowing where that was had started to be a real concern). Forty-Seven days to go (if that many) to get ready for her, and now I’m actually feeling more optimistic that we will actually, indeed, be as prepared as we can be. And on other fronts, as my belly gets bigger and bigger, my walk (OK, waddle) slower and slower, and my general energy levels lower and lower, I’m being forced to accept that I can only do so much, and that clients and coworkers and fellow board members, the unpacking in the new house, and everything else will just have to do without as much of me for awhile. And that that’s OK. Because I have a wonderful, other, part of life on the near horizion, and my attention has to be more and more focused there. It’s all starting to seem very real, and I’m getting very excited about being able to meet our new little one very soon! Emma did a great job finding and collecting her 10 eggs in the 3 minutes alloted for 2 and 3 years olds. (That’s Daddy in the near background, looking on, with a coffee cup). I held one of her hands, and she paused for a minute to arrange her baby so that the doll, which she was holding onto with her other hand, could ‘hold’ the stair rail as we ascended. For a while there, I got too busy to take and upload any pictures to Flickr, and for this blog. And now that we’ve moved, I still haven’t even been able to find our digital camera. 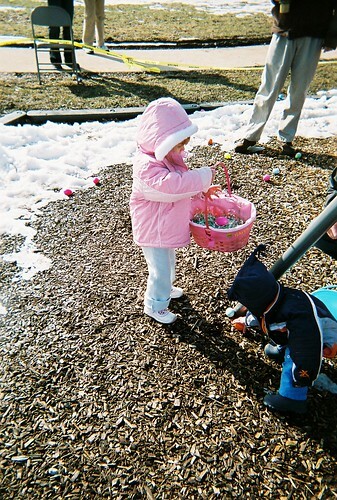 BUT, Paul picked up a disposable camera last week, since we attended a neighborhood Easter Egg hunt over the weekend. I’m going to get the film developed this week, together with a CD of uploadable pictures. So soon, we’ll actually have some photo updates to post! Posted in Flickr Photos | Comments Off on New Pictures Soon! So much for cyberspace karma. My last post was about how well we were all sleeping through the night, and no sooner did I post it than things changed for us. Wednesday night, at home, we noticed that Emma was not only tired (rubbing her eyes before 6:00 p.m.), but warm. Thursday and Friday, she had very high temperatures – in the 102-104 range. This freaked me out a bit, but I’ve since learned that kids this age can run fevers this high without it being as alarming as if an adult’s temperature were that high. She’s doing better now, but we’re all a little tired from the experience (the extra care and some night-time wake-ups, including one throw-up event in her bed at 3:30 a.m.; let’s hear it for waterproof matress liners!!!). We’re all on the mend now, though (knock on the Internet). It’s taken over two-and-a-half years of parenting, a move to a new house, and a trip to a hotel room in New Orleans for us to figure it all out. But now we have. And Emma (and we) have been sleeping better at night ever since. Our new house happens to be in a neighborhood with LOTS of light from the street that shines into the windows at night. Mostly, this is from street lights, although a lot of neighbors also seem to keep the porch lights, and or various garage/security lights on. Also, the bedrooms in our new house came with some pretty Levelor blinds. They are lovely things in two layers, but they are fairly translucent, and let in a lot of that street light. During our first several nights sleeping in the house, if we woke up in the night, we saw how very light it was in the room. It slowly began to occur to us that the high light level was negatively impacting our ability to sleep soundly through the night. And Emma had a lot of wake-ups, too, that had to be attended to. Then we went to New Orleans for a few days. And the hotel there – right on busy Bourbon Street – had “black out” curtains that kept out all light. We were surprised to see how well we slept through the night, and how rested we felt afterwards. We started to wonder if the colds we had were, in part, due to the cruddy sleep we’d been getting. I decided, after we returned home to our bright-night rooms, that it was time to shop for curtains. And I did a little research, and discovered that curtains can be “lined” or even “insulated,” with these labels indicating varying degrees of light-blocking abilities. I ordered some insulated “black-out” curtains for Emma’s room, and some decorative “lined” curtains for ours. Now that these are installed, the results have been amazing. Emma has hardly made a peep from the pitch blackness that is her night-time room, since we put them up, and we’ve been getting much better nights of sleep and feeling generally more rested and healthier, ourselves, too. As a baby, Emma had night-time wake-ups for a considerably longer period that some other kids do. I marked it all up to temperment and disposition. But what if we’ve finally now just discovered the key to keeping kids (and adults) asleep! It’s simple – just block out as much light as possible! What if the difference between parents who can get their 7-months old to sleep through the night and those who can’t can be explained only by the difference in the curtains in the two homes!? We’re now going to be putting up some black-out curtains in the new baby’s room, too, and it will be interesting to see how her sleeping patterns evolve. In any event, the ability to block light should help with daytime naps, at least. So we’re all sleeping better in the house now. If any of you think you might also benefit from some new curtains, I recommend checking out www.countrycurtains.com online. That’s where we got ours. They have a large selection of lined and “black-out” curtains that really do the trick! If anyone out there has the time and the inclination to write a book with the above title, please contact me about my cat, Jim. This cat loves me too much. (Can’t you just see that dewey spark in his eye?). And sometimes, it’s a little hard to take. Like on those nights, such as last night, on which he chooses to express his devotion by errupting in endless mad purring sessions, while walking all around my pillow as I’m trying to sleep. It’s hard enough, as a very pregnant lady, to get adequate sleep at night without this little guy robbing me of my Zs. Before Emma was born, I worried that between newborn care and Jim’s nighttime antics, I wouldn’t sleep all night. It turns out though, that Jim keeps his distance when there’s a baby in our bed – he’s afraid of little people. So at least I won’t have to worry about the midnight purring mania while the baby-on-the-way is very little. 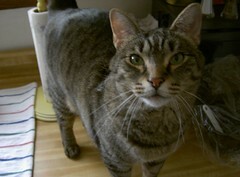 When Jim was younger, he would often startle me awake, usually around dawn, by biting my sleeping, unsuspecting ear. Luckily, those days are mostly behind us. I can’t help it that both of our cats love me so much. I really am their favorite of the household. I try to tell myself that this is some kind of cosmic proof that I am a good and sincere person. This is a phrase that always seems to amuse me on some level, when Emma uses it. She yelled it out several times today when I dropped her off at pre-school (but then soon settled down on a nice teacher’s lap for a story). And recently, when she was in my office at the end of a work day, briefly, as Paul and I had to transfer her from one of us to the other, she said it loud enough for a few office neighbors to hear down the hallway. Oh no, can it be…? You are currently browsing the cheese.rox weblog archives for March, 2008.